We've just put online a new release of our map tiles. We do new releases regularly, not least to pick up any changes in the data coming from OpenStreetMap and the latest updates from Ordnance Survey's OS VectorMap District. In addition this release for the first time includes C class, i.e. major yellow, roads at zoom 6. 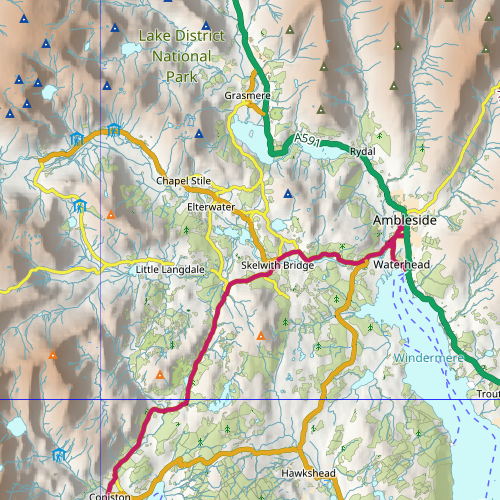 So in this case it means that Wrynose Pass (the yellow road heading west from Ambleside through Little Langdale) is now shown in zoom 6. We've also added wind farm turbines to zoom 6 which may be useful for navigation. These tiles are now live and in use both on the maps on our walks and in our GPS mapping application. You can comment on this post in our forum.